"Is she gonna be ok?" "Was it because she was so tired?" "Maybe, but it could've been the immortality being taken away. And the lack of food possibly." "What? I kept that book from the Manehattan Library!" "Hang on Summer! I think she's waking up!" Flower Bolt weakly opened her mismatched her eyes as she heard three different voices all around her, a cool breeze blowing on her face. As her vision cleared, her eyes widened as she saw Summer, Scamps, Connie, Twinklelight and Firefall staring at her in bed. Glancing around, a wave of relief rushed over her as she realised that she was no longer in the abandoned hotel building. Mirror Blood looked out the window at the dark Equestria outside, Shimmerdark at her side as usual and several of her vampires behind her. "Keep that Flower Bolt in that cell until she breaks, then get in with the stakes. Then we'll go after Equestria as well. She won't get in my way this time." Everybody suddenly flinched as a familiar voice was heard from behind. Turning around, Mirror snarled as she saw Flower Bolt, still covered in blood, glaring at her while angrily showing her fangs with Connie, Twinklelight, Summer and Firefall by her sides, Scamps sitting on Summer's back. The other vampires hissed at the group angrily, until Mirror gave them the signal to stop. "I should've figured you'd find a way to get out of there eventually." She groaned, not taking her eyes off Flower. Flower's angry glare didn't change. Instead, she just stood forward, opening her wings out to hide her friends behind her. Flower slowly opened her eyes as a pounding pain rang through her head. As her vision cleared, her eyes widened at her surroundings. In front of her were a row of colourful crystal bars, as were the walls all around her. The floor beneath her was made of crystal too, all clearly from The Crystal Empire. She looked around frantically. "Connie!? Twinklelight!?" Turning around, she gasped as she saw Twinklelight chained to the wall of crystal, looking up at her friend in worry. "What's going on? What happened? Why are you chained to the wall?" Flower asked in a panic. Twinklelight just put the end of her tail up to pause her. "Mirror Blood found us after the rubble nearly dropped on us, and she knocked us both out. Next thing I know, I'm chained up in here and you're asleep on the floor. Your forehead's bleeding by the way." She explained. Flower put her hoof up to her forehead, and when she brought it back down, it was stained with her own blood. Twinklelight watched Flower Bolt's ears flatten as she, her and Connie looked up at the abandoned Canterlot Hotel building. Connie gently pushed the damaged door, causing it to creakily open. "Alright, we should head on in." He suggested. Flower immediately walked in front of him. "Ok. Follow me. The inside of the building was just as creepy, if not more so. One small kick on any of the walls could've caused a massive avalanche of debris, or they could easily fall apart. Flower covered her muzzle in a panic as a tempting smell suddenly wafted into the room. Connie paused as he noticed his sister's behaviour. "What is it? What do you smell?" He asked with a raised eyebrow. Flower slowly lifted her hoof away from her nose to smell the scent, following it over to a small silver bucket with a strange red substance inside. As Flower inhaled the scent even deeper, her eyes widened at what it was, and she immediately raced out of the room, Connie and Twinklelight following closely behind. "Hold up... WHAT HAPPENED TO YOU!?" Flower, Twinklelight, Connie and their red unicorn stallion friend Firefall were sat in the middle of the Everfree Forest in the shade. Without the sunlight, it was safe for Flower to take her cloak off without being fried, until Firefall began staring at her bat wings with a dropped jaw. Connie cleared his throat as he noticed Flower shifting uncomfortably. "So, anyway, Flower was bitten by a vampire, we need to find the vampire who did this, and she needs to bite her back. But we got some advice from someone about Fire Magic. Does this mean anything to you Firefall?" He explained. Firefall scratched his chin at Connie's question, looking up at the patches of sunlight in the distance, then down at his cutie mark of three fireballs, then at Flower Bolt's wings and ears. "Well, since the sun is practically made of fire, and the sun harms vampires, then I think fire would do the same..."
Hey guys. I know I haven't been around very much lately, but I want you to know something. I still miss you, and I'm sorry for not being around. You guys have been amazing friends to me, and I'm very grateful to you. The busiest part of college is over now. I'll soon be drawing much more than usual (and that's saying something! ), and I'll be able to balance drawing my original work with my work for here. I'm sorry I couldn't get all my friends on here in this, but I do have more empty (and bigger) sketchbooks, so there's plenty more where this came from! If I've made any mistakes or used any wrong colours, let me know. In the city of Artshire, stepsisters/best friends Maeleah (Mae) Nightinshire and Louise Talington and their best friends Adyson, Oliver, Shania, Peter and Chloe and their beloved pets are sick and tired of sitting through their boring classes and sitting around their homes bored. But their imaginative spirits are never too far away, as each day, a Spark occurs which lands in a new imaginative idea. But it doesn't take long for the crew to realise that their imaginations are slowly leaking into reality, turning any small part of their imagination into real life! These seven friends must protect their city and each other as they face their own imaginative ideas causing havoc across Artshire, while playing in their band, the Sparks Of Imagination. -Mae and Louise are now stepsisters rather than just best friends. Rain and I just thought that since they're so close, they may as well be related, but we liked the backstories already given to them, so this was the solution. Plus, Rain and I sometimes call each other sisters. -The main cast has moved up from two members to seven members. It's hard to do a whole series with just two characters, even with Sydney, Spot and even Mae's older sister Elizabeth in there. So I decided to add a few more characters, who are partly based on other characters I've created like Blossom Breeze, and other people I know. I'll upload some stuff of them eventually. This can also give us more opportunities for story writing with more characters to write about and develop. -A LOT of stories have been planned. We've figured out the schedule, and some have been finished, so it'll be time to get started on those soon! So, you're probably wondering why I'm saying all of this. Well, that's because I have a special announcement. I am making a website specifically for Sparks Of Imagination. Some of you may be wondering why I'm doing this. Well, I've been learning about some stuff about working on websites at college lately. I felt like this was a good way to show what I've learned. 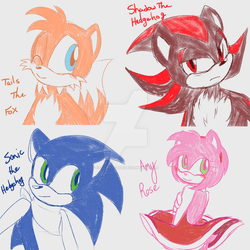 Plus, I don't want to put any more stories here on DA. Once Heart Of A Monster is done, I'm finishing with stories here. Plus, my Dad has offered to help me with this project, which I'm happy about, since we haven't really done much online together since Club Penguin. I'll still post artwork of the stories along with sneak peeks to stories here, and I'll make the announcement when the website is up and running. Thank you for reading. Take care. It... started out stressful, kept getting more stressful and stressful as the months went by, up until I finally finished school, with only a few happy gems in between such as getting back into some of my other favourite shows. Well, despite it all, I'm happy to finally be here now. Ready to start a new year with a new me. However, there are a few things I'm not looking forward to next year. Let's talk about that for a while. Ok, so a while back some character designs for a new generation of MLP got leaked, and then rumours started to spread about the show's 9th season being the last season. Well, I can't say I'm surprised. If I did, I'd be living a lie. After all, G3 started when I was a year old, and went on until I was eight or nine! I had very little trouble accepting the newer versions since I was always open to change. I still question parts of my childhood. However, G4 did something to me that G3 never did. It left an impact on me. I learned from the morals, I memorised the characters and the world, I discovered an amazing fandom, I made friends, I travelled to new places, all from ONE show. Only one other show has impacted me like this, but I'll save that for another day if you want. The show was brilliant. But what's the bad part about a brilliant show??? Harsh truth, but I've faced it before. But honestly, that may be for the best. If G4 goes on for far too long, it could end up going horribly wrong somewhere down the line. I don't want that to happen. It's best for a show to end rather than let it stay and unintentionally overstate its welcome. As long as there are reruns on TV, I'll be happy. Now, I mentioned a long while ago that even after the show ends, I'm still going to be a pegasister. That's still true. There are plenty of fandoms that are still going even after their show, movie series or whatever has ended. Like I said once before, just because a show stops, it doesn't mean that the fandom has to stop with it. So, the past is behind us, and it's time to move on to what the New Year will bring us. I have a lot of special things planned, one of which I'll make the announcement for later this week when I get home. And when MLP does truly end, in this year or another, it may sting for a while, but eventually. I won't be crying because it ended. I'm going to be smiling. Why will I be smiling? And that's all that matters right? Hi everyone! Happy Christmas! I wish I could’ve uploaded something for you all for tomorrow, but I’ve been busy working on an original, special project of mine. I’ll talk about it more sometime before the new year! Hi! My name's Flower Bolt, but my friends call me F.B for short. I'm just a simple Brony artist practising my drawing skills. Keep in mind that I'm still learning so it's not gonna be perfect. Drawing is something I do out of my free time, which is these days, very limited. Please be patient if it takes a while for me to update. I also write stories and own a YouTube account. I'm also very shy, so I may be a bit sensitive. Thank you for checking me out, and remember, Music Is A Part Of Life! Make The Most Of It! Favorite visual artist I don't have one Favorite movies Across The 2nd Dimension, A Dog's Purpose and Lego Batman movie Favorite TV shows Phineas and Ferb and My Little Pony Favorite bands / musical artists Owl City Favorite books Worldquake and Twilight Favorite writers None Favorite games Minecraft, Club Penguin, Spyro and Skylanders Favorite gaming platform Xbox 360 or PlayStation1 Tools of the Trade ??? Other Interests I'm very shy, so I spend most of my time alone. My head is constantly buzzing with new ideas for fun things to do. I do also like to spend time with my best friends. Oh, and I have a camping fever I love to sleep outdoors.